Our goal has been to create and publish unique high-quality gluten free recipes for those people with gluten-free / wheat-free / Celiac Disease diet requirements. 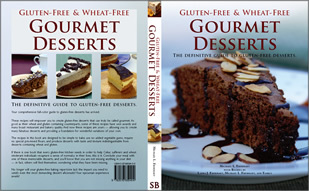 Now, after thousands of our GF desserts cookbooks have sold (Print and Kindle editions), we decided it was best to reach an even larger audience and simply make these Gluten Free Recipes available to all of our fellow Celiac Disease sufferers and gluten-free diet followers, here via this website. Whether you are an individual baking at home, or a commercial bakery or restaurant that wants to gain entry to the growing Celiac and Gluten-Free / Wheat-Free market, our recipes are for you! Our recipes will produce foods truly worthy of being called gourmet and will jump-start your GF baking with incredible, quality foods that can be nearly indistinguishable from the “real” versions. Some of our gluten free recipes have even won awards competing against their gluten-containing counterparts! Our gluten free recipes have been individually crafted, tuned, tested, baked, and photographed to address the needs of Celiac and Wheat-Free individuals of all ages. Our collection of extraordinary recipes provide a perfect and invaluable resource for anyone preparing food for wheat-intolerant or celiac persons or groups. Now you have the required resource to even bake a great gluten-free birthday cake — one that rivals a normal cake from a bakery — for a friend or relative with Celiac Disease or gluten-intolerance and show them just how much you care! easy to make, with simple concise instructions even amateur bakers can follow — many of our gluten free recipes are as simple as mixing ingredients together using a mixer. address the needs of Celiac (gluten free, gluten allergic, gluten intolerant) and Wheat-Free (wheat allergic, wheat intolerant) individuals of all ages. In addition, according to some medical practitioners, autistic children and kids exhibiting signs of autism may benefit from glutenfree diets. Check out our Gluten Free Recipes Library for our latest publicly available glutenfree recipes. The many cookbooks in our house — purchased during my pre-Gluten-Free years — all shared the same characteristic great recipes and full-color photos of the completed foods. When I was first afflicted with Celiac Disease and forced to adopt a gluten-free diet, my wife and I went looking for gluten-free cookbooks that were similar in quality to those in our existing cookbook collection. However, we did not encounter any — the mid-2000s were still the early-days of living gluten-free and Celiac Disease was a rather obscure topic. The few gluten-free recipe books available on the market at the time were unacceptable on many levels — these GF recipes (in the mid 2000s), especially desserts and breads, were nothing short of awful and nearly all of the published recipes used the same ingredients and approaches that produced the same sub-par results. Furthermore, and unsurprisingly, these same books lacked pictures, especially color photos, to provide visual evidence of what each recipe should produce. That experience frustrated me considerably, as I was not willing to spend the rest of my life living without the delicious desserts and baked-goods that I had known before developing this gluten-allergy! I refused to accept mediocre (or worse) foods as being acceptable substitutes for quality foods, just because gluten was omitted. I was told that GF foods had to be this way and could not be like regular baked goods. Total nonsense! I was convinced that the answer was to simply ignore established approaches to gluten-free baking and start from scratch: learning, developing, and perfecting the methods required to produce the many dessert recipes which ultimately arose and formed the truly extraordinary collection in our cookbook. The book conceived was designed to deliver that “coffee table” cookbook feel, along with great glutenfree recipes, to the Celiac and Gluten-Free community. Even if the number of books sold was low, I knew that “bigger names” in the business would take notice of how we broke new ground in this industry and made a very forthright attempt to “raise the bar” for gluten-free cookbooks and baked products in general. Our cookbook was the first gluten-free desserts recipe book on the market produced completely in full-color throughout and showing visual proof of what each and every one of our quality-tested recipes produced — what appeared in the book images is what each recipe produced : every recipes was baked per directions and then pictures were taken of it. The results speaks for themselves — thousands of books sold and it received a perfect 5-out-of-5 rating on Amazon (Kindle edition). I am quite thankful I had a supportive family, otherwise this GF desserts book would never have existed. I may have had the early vision and dreams for such a recipe book, but it only came into existence thanks to the tireless efforts of my wife (who spent nearly two years creating and baking these awesome recipes), my daughter (who also helped create recipes while she performed book editing tasks), and even my mother (who joined in and created a few GF versions of old-time family favorite recipes from her own mother and grandmother). Great GF recipes are the key to living life to the fullest and feeling unencumbered by the dietary restrictions of a lifelong disease! I hope our Gluten-Free and Wheat-Free Gourmet Dessert Recipes help you to quickly make the transition to an enjoyable and fulfilling gluten-free life. You now have fantastic desserts to look forward to — the fact they are gluten-free will no longer mean that you are missing your favorite birthday cakes and other favorite desserts! I thank everyone who supported me and my family throughout the development of the book and these recipes, and appreciate everyone who purchased a copy while we offered it for sale! I an delighted in knowing that the time invested in these recipes and this book has made you and others with Celiac Disease regain a sense of normalcy and culinary satisfaction in your diet.